PHILIP HERMOGENES CALDERON Five autograph Letters Signed. A series of 5 ALsS. 13pp. 9 Marlborough Place St John's Wood (1) and Burlington House, Piccadilly, W. (4). All to Miss Shapter and one retaining its original envelope addressed to Miss Shapter at 7 Clarendon Place, Hyde Park Gardens. December 27th 1871, December 7th 1891, July 13th 1894, August 14th 1894 and May 4th 1897. 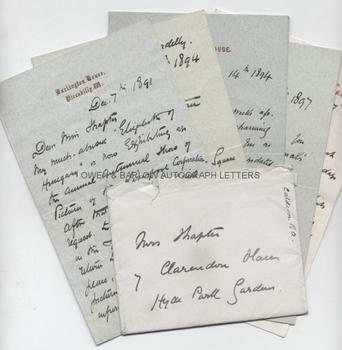 A fine correspondence dealing with a broad range of subjects, including viewings of his exhibitions, recommending Dyer and Sons as restorers for her William Boxall painting ("Boxall's pictures are tender things and Dyer knew Boxall well"), Calderon's various illnesses and his appeal to Miss Shapter to find him accommodation in Broadstairs, where he had been told to go to recuperate. The letter of December 7th 1891 being of particularly good content, referring to the scandal caused by his painting 'Elizabeth of Hungary': "My much abused 'Elizabeth of Hungary' is now exhibiting at the annual Autumnal Show of Pictures of the Liverpool Corporation. After that it goes, by special request, to Leeds - and somewhere in the Spring. I imagine it will return to London to take its place with the Chantrey pictures at Kensington - provided infuriated (but sadly ignorant) Roman Catholics do not succeed in their attempt to 'burke' the picture. So I fear your American friends must be content with the reports of the row about it, without seeing the cause. If, however, they should in their travels, chance to pass a night at Amiens (on their way to their Earthly Paradise, Paris) they can see almost the same thing in the very heart of its glorious cathedral there, or, (to go no further than Great Russell Street, Bloomsbury), they can see the mother of Thomas Becket being baptized in the exquisite Royal MSS in the British Museum." His last letter, dated May 4th 1897, has a somewhat depressed tone to it and begins "How good and kind of you to remember this poor animal's birthday! You and I have had a bad time but I trust we may be spared." 8vos. Approx 7.5 x 4.5 inches. All letters are complete with thir integral leaves, etc. Fine. Philip Hermogenes Calderon was initially associated with the Pre-Raphaelites before moving to the historical genre. His subjects, however, continued to be influenced by the Pre-Raphaelite style and his paintings often featured beautiful women in silk and embroidered attire in naturalistic settings. Philip Hermogenes Calderon was a member of the group of painters known as the St John's Wood Clique, which included Henry Stacy Marks and George Dunlop Leslie. His 1891 painting, 'St. Elizabeth of Hungary's Great Act of Renunciation' showed a naked St Elizabeth on her knees before an altar with Catholic priests looking on. This caused a great scandal amongst the Roman Catholics, who peceived in it an anti-Catholic message. The picture was acquired for the nation by the Chantrey Bequest and is now in the Tate Gallery. Towards the end of his career, Philip Hermogenes Calderon became Keeper of the pictures at the Royal Academy. From a 19th century collection made by Miss Shapter, a daughter of the Exeter surgeon and pioneer epidemiologist, Thomas Shapter, best known for his book on Cholera.